If this was in a Disney cartoon, he’d be voiced by Jeremy Irons. Uh lemme guess, agent orange? This may be a liger (lion + tiger hybrid). I’m not sure though. I’d guess it’s a photoshopped morph between a tiger and a persian cat or maybe even a pug (or similar dog). His name’s Kenny and he’s a retarded inbred white tiger who lives at the Turpentine Creek Wildlife Refuge in Eureka Springs, Arkansas. Really. There’s a photo/blurb about him in one of the past couple New York Times Magazines. aww retarded things are cute! 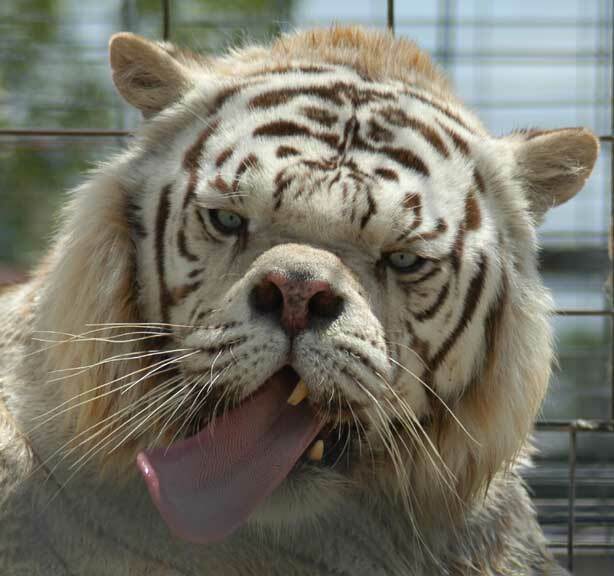 i love retarded tigers from arkansas!